Response to a paper by Hermann Harde, from Ken Rice at … And Then There’s Physics. One by Gavin Schmidt at RealClimate. 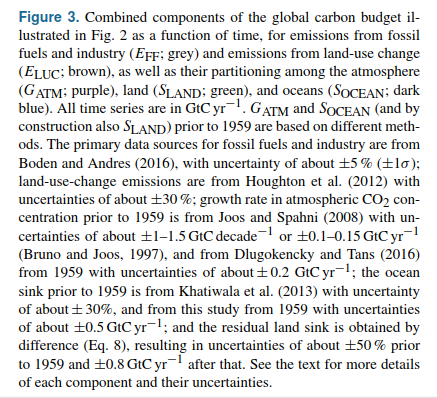 As David Benson kindly explains, all is explained in Chapter 4 of Principles of Planetary climate. I’ll also add (for people who want the 6-page version) that my Physics Today article is all the refutation Harde needs. The fact that the AIRS observed spectra of Earth’s outgoing radiation exactly matches the computation done by the line-by-line code (which in turn validates the band-averaged codes used in GCMs) makes it impossible that Harde’s calculation can be right. If he thinks he has a case, he has to show that he can reproduce the AIRS spectra — also the similar CO2 features one sees in the Mars TES observations, etc. 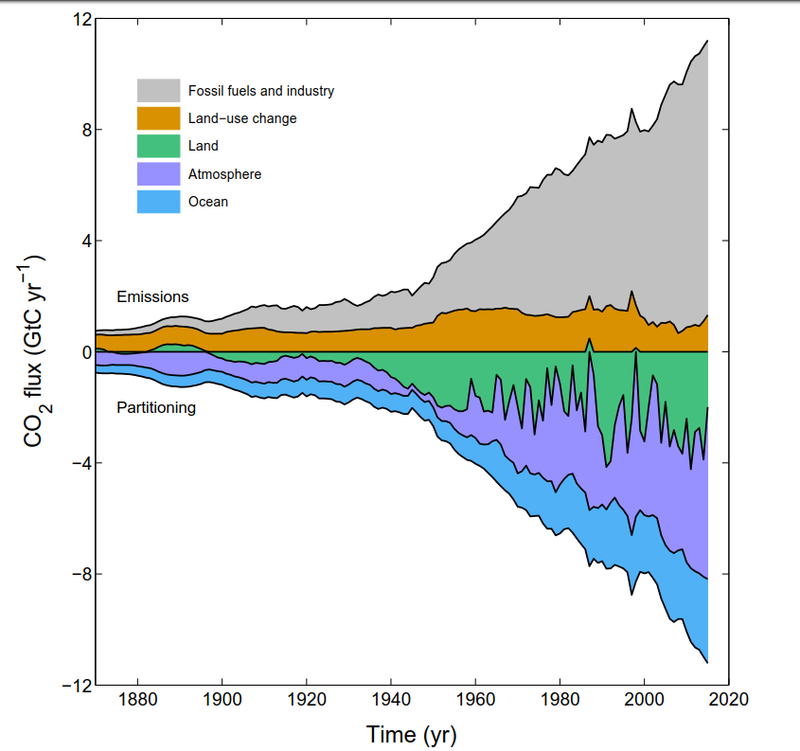 The above is a reproduction of Figure 3 from C. Le Quéré, et al, “Global Carbon Budget 2016,” Earth Syst. Sci. Data, 8, 605–649, 2016. This kind of thing is why, unfortunately or not, the general public cannot be expected to understand these questions without a good grounding in science and what are, perhaps, the less popular fields, like physics and some maths. The courtroom or Congressional committee techniques of stacking up supposed experts does not work here(*). (*) Actually, some statisticians have found courtrooms to be wanting as means of ascertaining truth, too. This entry was posted in American Association for the Advancement of Science, American Meteorological Association, American Statistical Association, AMETSOC, atmosphere, being carbon dioxide, Carbon Cycle, carbon dioxide, chemistry, climate, climate disruption, climate education, Climate Lab Book, David Archer, diffusion, diffusion processes, fossil fuels, geophysics, Global Carbon Project, greenhouse gases, ignorance, physics, Principles of Planetary Climate, Ray Pierrehumbert, science, science education. Bookmark the permalink.